Partnership working with service users and carers is an integral aspect of healthcare practice and education. 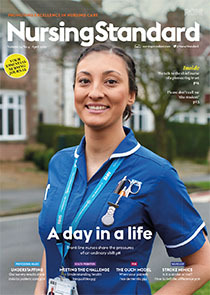 Increasingly complex healthcare environments, alongside changes in higher education, have led to the development of innovative learning strategies, resulting in opportunities for service users to participate in nurse education. This article describes the planning, implementation and evaluation of a co-facilitation approach to learning, in which service users and carers worked alongside lecturers to facilitate small seminar group activities with first-year undergraduate nursing students. Aim To evaluate the effects of a co-facilitation approach on nursing students’ classroom learning. In this approach, service users and carers co-facilitated small seminar group activities with lecturers. Method The co-facilitation approach was introduced concurrently in 14 groups of first-year nursing students across adult, child, mental health and learning disabilities fields of nursing in one higher education institution. The approach was evaluated using a questionnaire comprised of open-ended questions, which was distributed to the nursing students after they had participated in the facilitated group sessions. Findings A total of 198 nursing students completed the questionnaire. Their feedback was positive, indicating that they found the participation of service users and carers in the facilitation of group activities a stimulating and inspiring way to learn, and it improved their understanding of person-centred approaches to care. Conclusion The involvement of service users and carers in classroom learning is meaningful and relevant to nursing students’ education. The co-facilitation approach enabled them to understand the person rather than only the patient, which is essential in providing person-centred care. However, it is necessary to identify the means to support students to build resilience and maintain their learning in challenging healthcare environments.